Do you hear that heavy thumping in the distance? It sounds like it’s getting closer! Actually, the phenomenon you’re experiencing is the dinosaurs of Jurassic World: Fallen Kingdom rushing to theaters on June 22nd. It’s going to be WILD! Familiar faces return to the silver screen to take on a monstrous new challenge on Isla Nublar. Bryce Dallas Howard plays Claire Dearing, the former Jurassic World park manager, and Chris Pratt returns to his role as Owen Grady, the dinosaur trainer. This movie follows the first installment of the Jurassic World trilogy, which ranked the 4th highest grossing film of all time and brought in $1.67 billion globally, proving that our love for these giant prehistoric reptiles will never just be history! So, is it a surprise that dinosaur birthdays are such a SMASH right now? Jurassic World may be geared towards boys ages 6 through 11, but “ROAR I’m 4” birthdays, dino-mite birthdays, and other scaly celebrations can be found all over the internet. Everybody wants a bite of this big birthday fun! 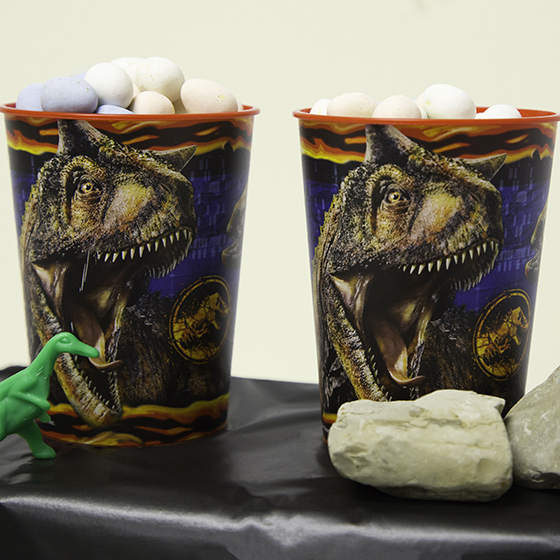 A recent survey discovered that 83% of kids prefer Jurassic World dinos over regular dinos! 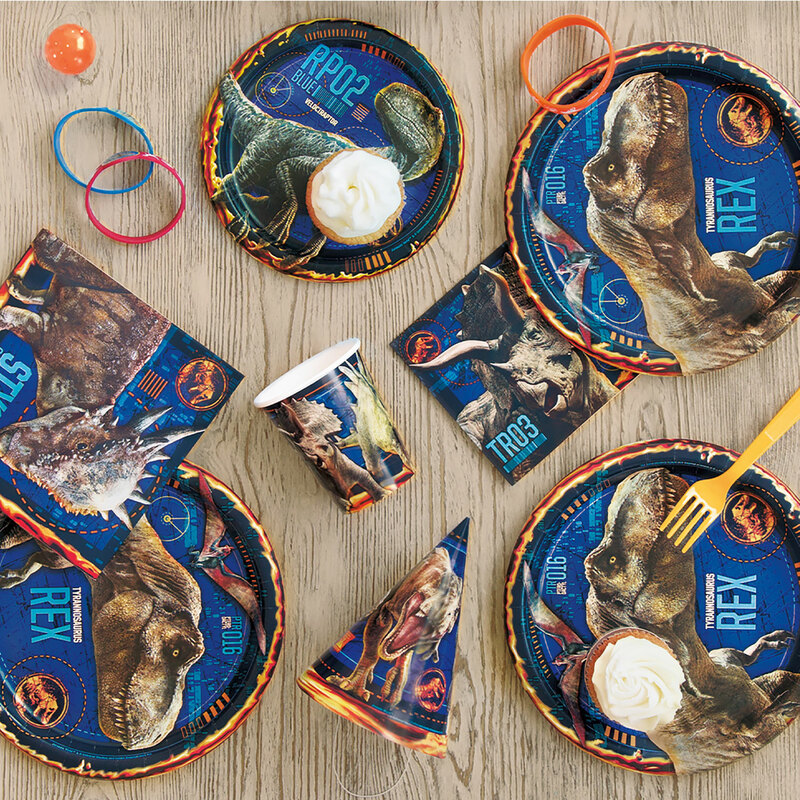 That’s why our licensed Jurassic World party supplies, decorations, and favors feature Blue the Velociraptor on the prowl and the daunting Rex (you can guess who he is). More experienced dinosaur experts will be able to identify other dinosaurs like Stygimolochs, Triceratops, Pterodactyls, and Carnotauruses too! 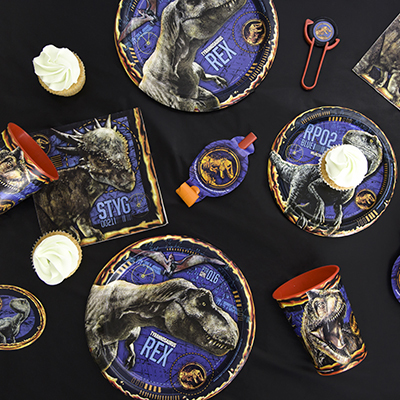 Our Jurassic World plates, napkins, and cups will help create a table setting partygoers will want to stomp to. Then, kids can celebrate on a larger scale with our Jurassic World pull pinata. 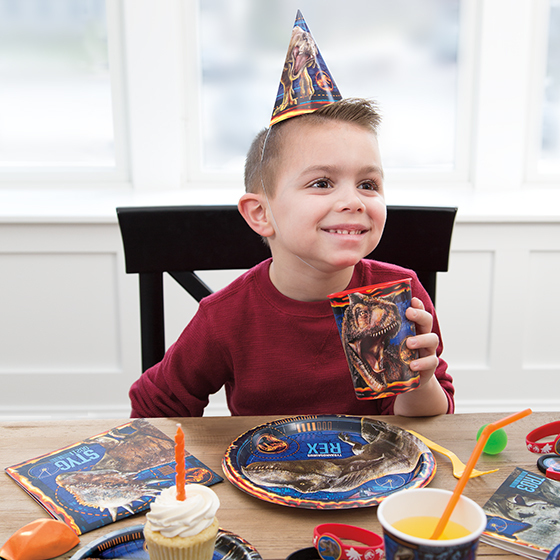 This ferocious party ensemble even includes a fun new item: lenticular stickers! These cool new stickers appear to move as they’re turned, and they’re sure to be a blast. Don’t wait for the dinosaurs to go extinct! 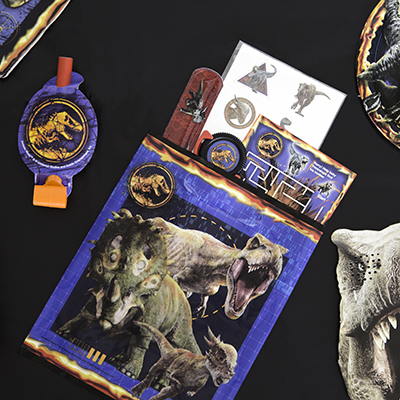 You can find all these Jurassic World party supplies, decorations, and accessories online or in your local party store.